Snowed in. Closing the laptop, making a sandwich, and going to catch-up on my reading. 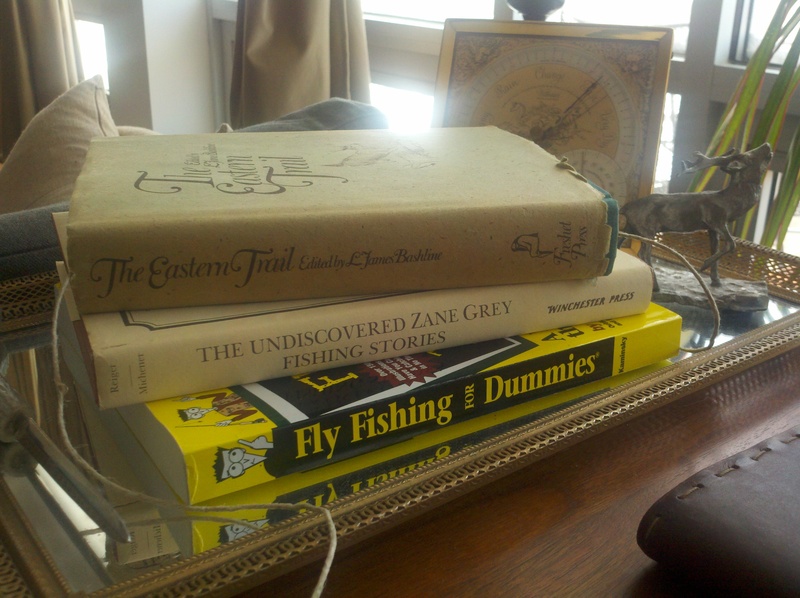 I’ve been reading The Eastern Trail all weekend now since picking it up at an antique mall in Savage, MD. 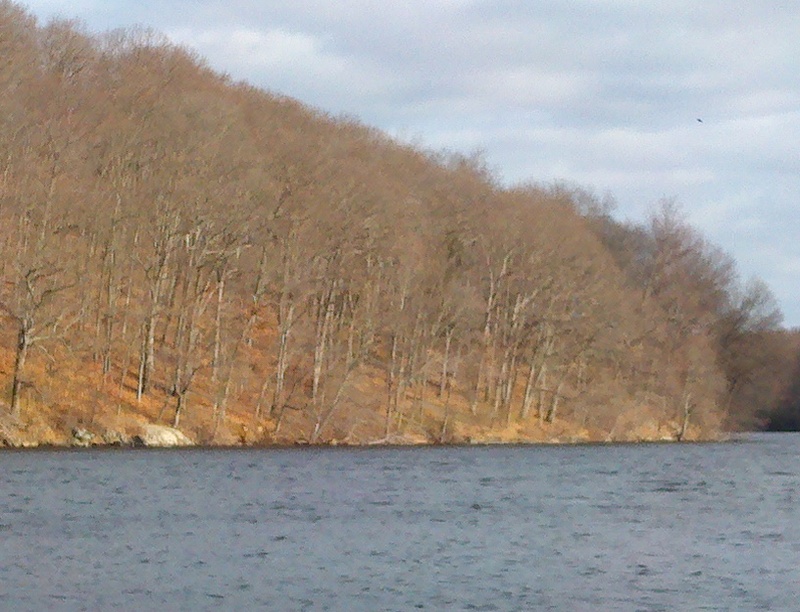 Its a great primer on hunting (upland, deer), and angling in the Northeast with a special focus on Pennsylvania and New York. Bashline was a great Pennsylvanian outdoor writer who wrote a definitive book on Night Fishing for Trout (which I have yet to pick up). 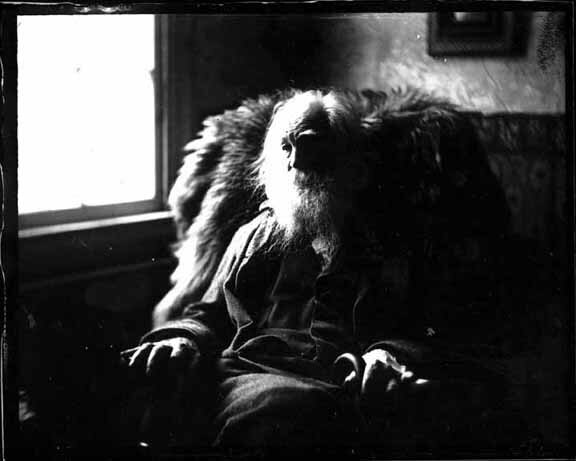 The selected writers in Trail have a wonderful style– evocative of hunters who grew up in the 50s, plain-spoken, advocates for conservation, instructive, just a bit obstinate, and deeply passionate. 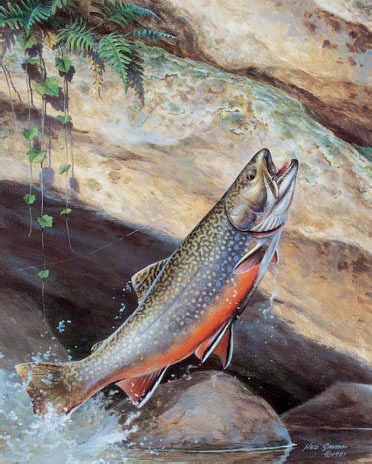 There are lovely illustrations by famed wildlife illustrator and Pennsylvanian, Ned Smith. Merry Christmas (belated), Happy Boxing Day (on-time), Happy New Year (just a bit early). Spent the last few days in Maryland and Virginia with the family. I recently helped my dad move to Richmond, VA. His new place is in the formerly industrial area of town called “Schockoe Bottom” along a canal on the James river. Its one of the oldest parts of the city dating to the late 1700s. 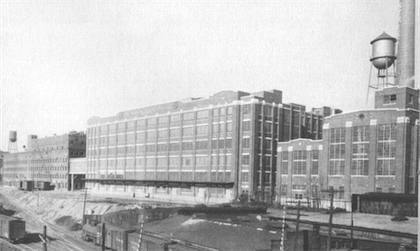 Like any waterway, mills and industrial warehouses populate the area known also as “tobacco row.” The neighborhood jewel is the original Lucky Strike plant which has been renovated by Odell & Associates into a mixed-use studio and living complex. The plant and many buildings sat in disrepair for decades and only recently has the neighborhood come back. Pop is in a former warehouse nearby across the street from the old county courthouse. The historic area feels “salvaged” and could set quite the example for how to reclaim industrial zones in our urban centers. Fishtown in Philadelphia, Williamsburg in Brooklyn, and River North in Chicago spring to mind as successful conversions. Buildings in the area have steadily been renovated since the early 90s. Hopefully they will pay strict attention to the history and do their best to preserve it. One of my favorite features of areas like this is “ghost signs”, advertising for now defunct products from the turn of the century that would have been hand-painted. 100 Word Minimum has done a nice job capturing “ghost signs” from historic Richmond. 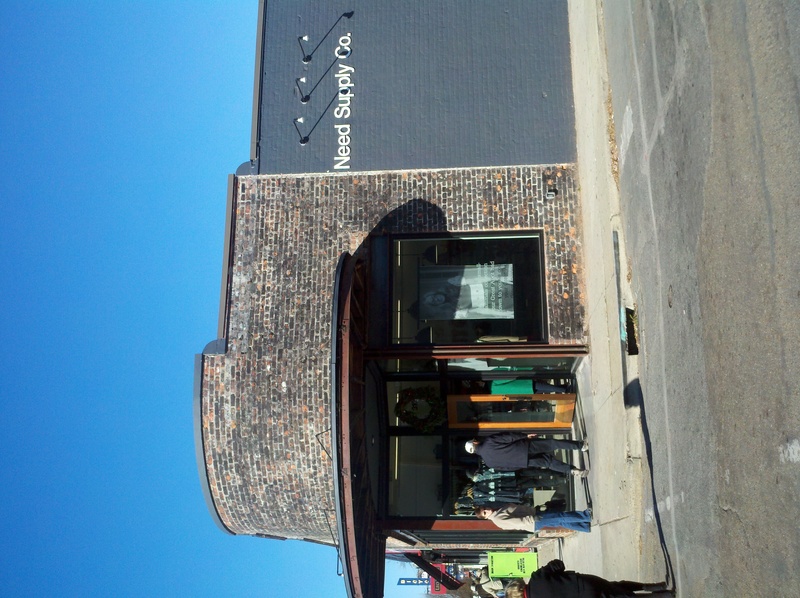 We also had time to stop at Need Supply Co, a high-end clothing boutique in the Carytown area. Some solid brands, A.P.C., Wolverine, Tanner Goods, the Hillside… Personally, I think they’re missing out not stocking at a wider price range–I love Raleigh denim but can’t afford justify it! 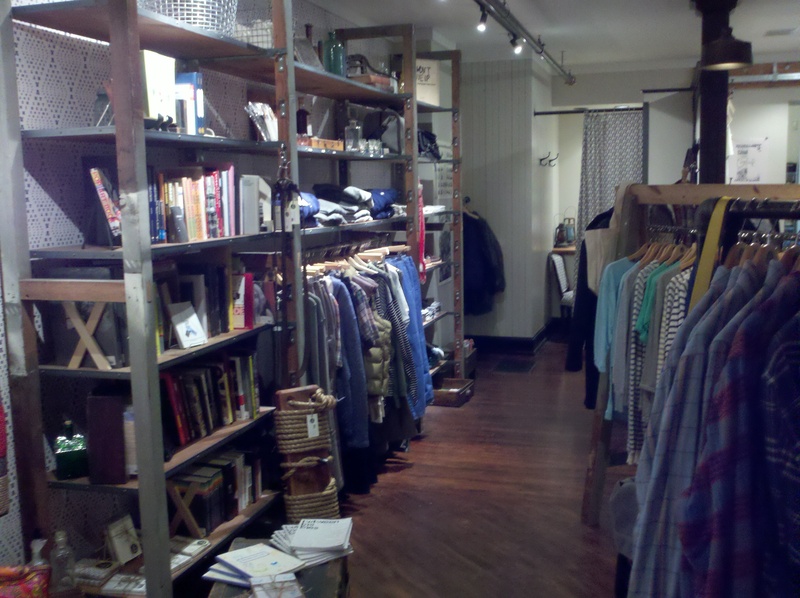 Still, the selection was well edited and a good choice of American-made goods mixed through-out. Apparently they’ve been around since ’96 so that’s a damn good thing. Down the street, the local Carytown Cinema, the Byrd, was beautiful and I wish I could have gone in but we were there too early. 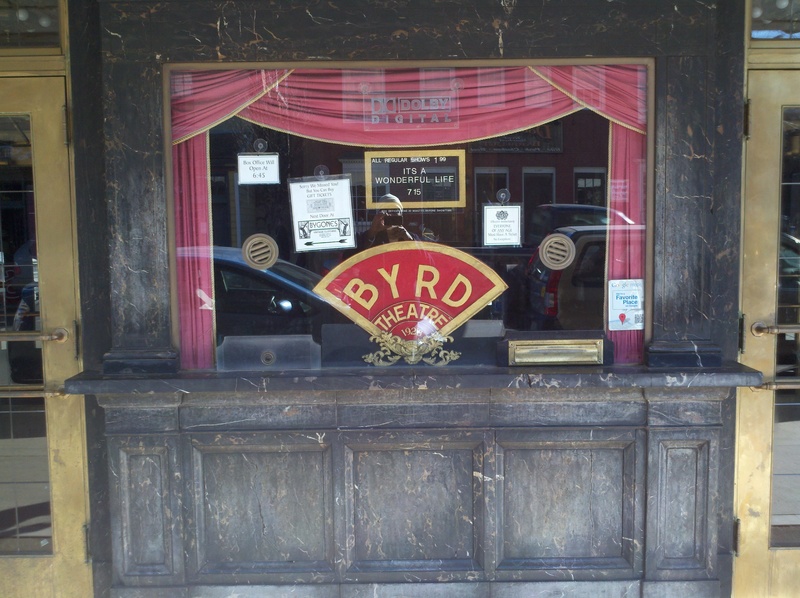 The Byrd reminded me of the Music Box Theater in Chicago, another great movie palace of yesteryear (built in the depression-era and just a year after the Byrd in 1928). 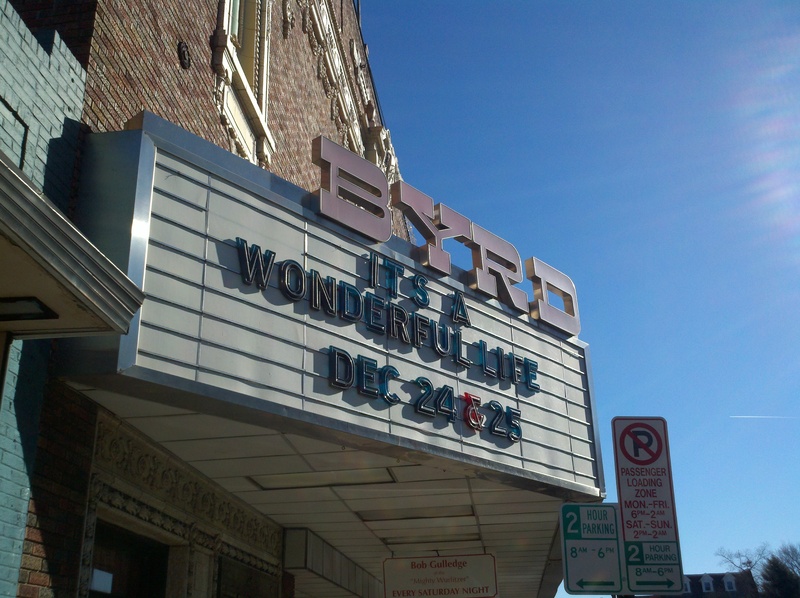 Loved that the Byrd was showing “Its A Wonderful Life” on Christmas Eve and Day. I look forward to spending more time in Richmond rooting out the best food, restaurants, and of course, a bit of that Civil War history. As the one-time capital of the confederacy, I’m sure there’s lots to uncover on future visits. Lastly, you’ll recall I brined my bird on Thanksgiving. Well my brother not only brined his, he smoked it too, and he did it again for Christmas at my brother’s place in Fredericksburg. 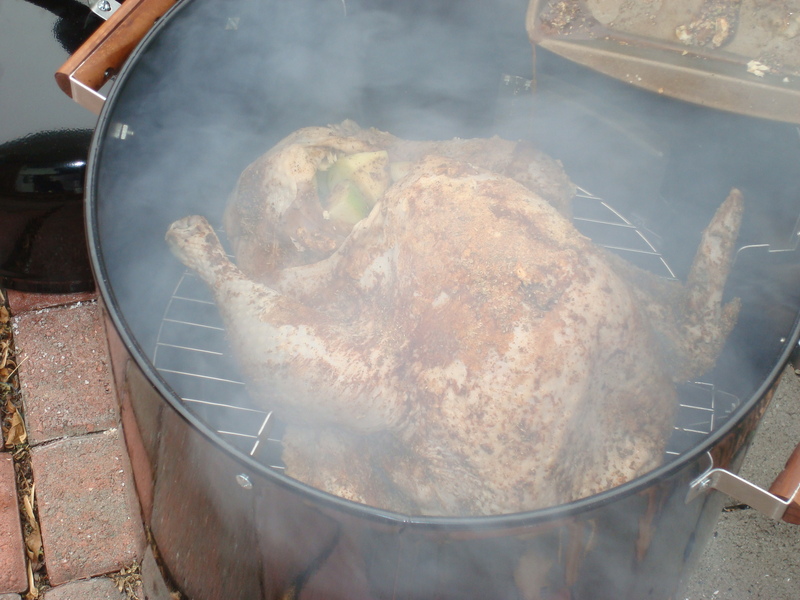 It was honestly, the best turkey I’ve ever had (pecan and applewood chips imparted a gorgeous bark and flavor). Seriously, next year, I’m getting my license, and I’m going turkey hunting. I’m gonna hunt it, kill it, brine it, and smoke it. How else am I going to compete? Made it to Partners & Spade yesterday after wading through gobs of shoppers in Noho/Nolita/Soho while looking for a little something something for my wife. I’d tell you where I shop but since my wife reads the blog on occasion I wouldn’t want to spoil the surprise. Score! 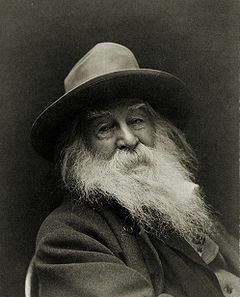 W.M. Brown red wine vinegar (splashing it over the broccoli tonight for an improptu get together over a couple of brined roasters). 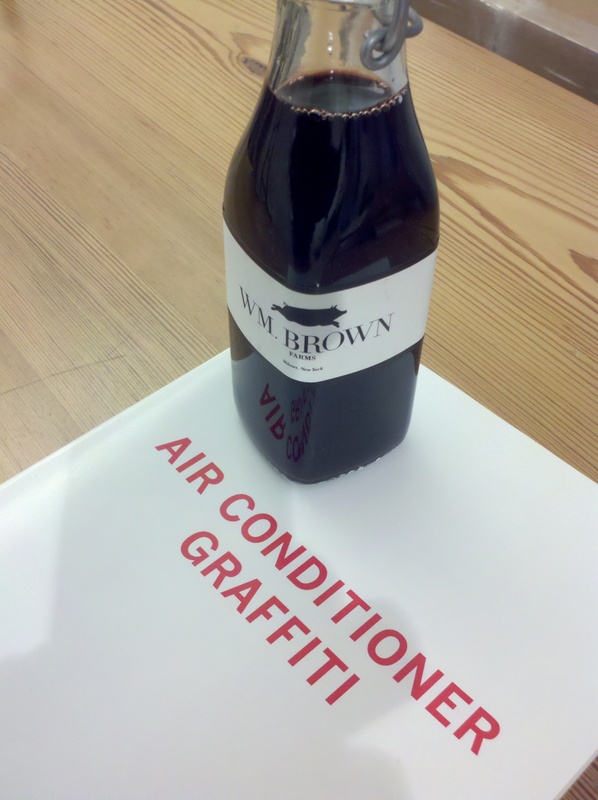 I also picked up Partners & Spade edition of “Air Conditioner Graffiti.” I collect books on graf, stickers, street art, stencils, from all over the world, must have well over a dozen books. My fav has got to be Supply and Demand (Shepard Fairy) and Tristan Manco’s Graffiti Brasil. Exhausted. 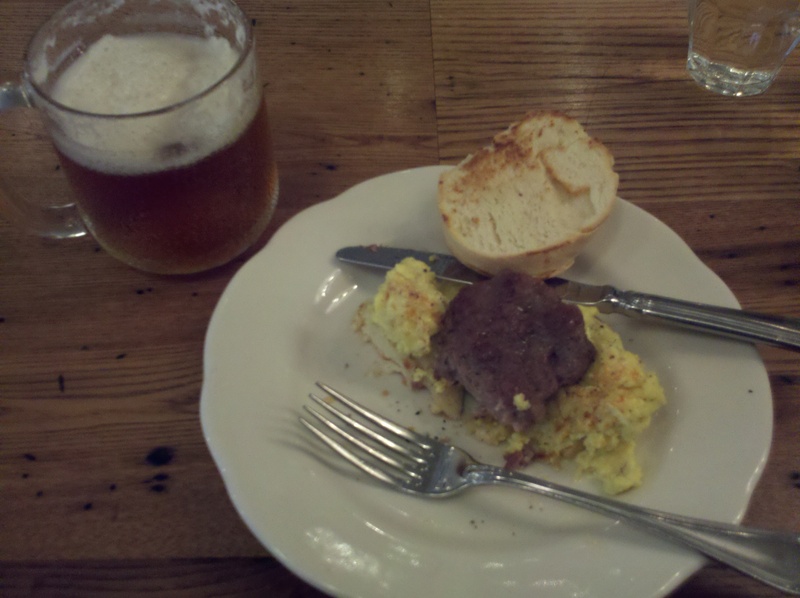 Stopped at PEELS for biscuit, sausage, cheddar-scrambled eggs and a Lagunitas. 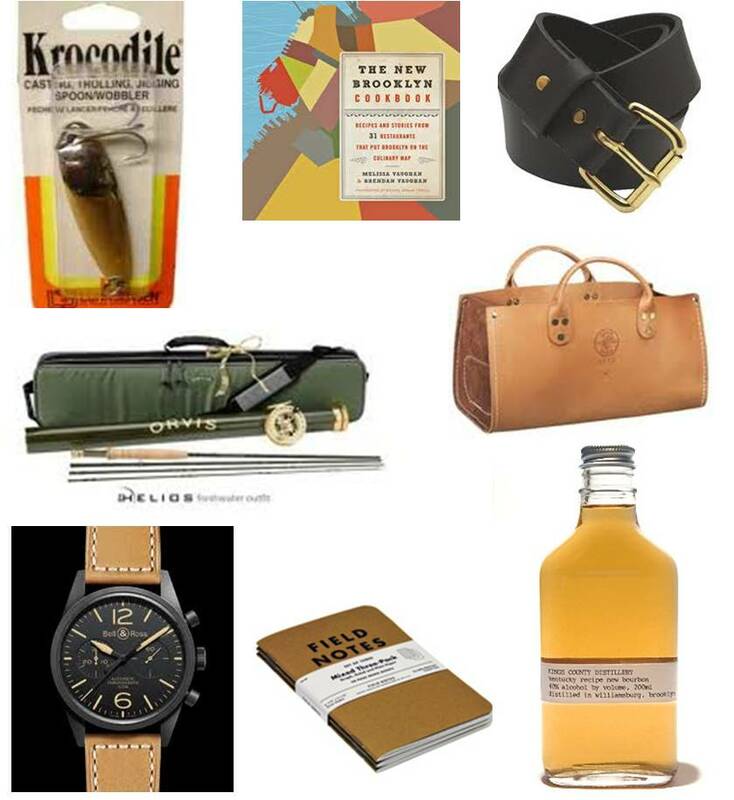 Lots of blogs are doing the “what i want for xmas thing”…beats the sterility of the Amazon.com Wishlist I guess. What do I want? I just moved from “regular” to “contributing” member of the Sierra Club, Nice! remember, give yourself a gift that gives too! 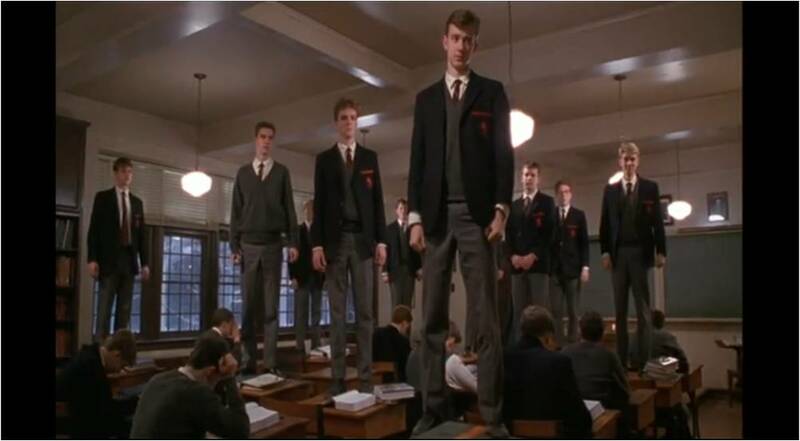 Its ok I tell you…its ok to give yourself a Christmas gift. Many people do. At some point in the year, you have to stop and remind yourself you care about that face in the mirror–that you want him to be happy, to grow, to be appreciated. Oh sure, you hear the TV prattle on about giving yourself the gift of time, gym memberships and crap like that, but I find the best gifts to myself are the ones that tend to pay dividends to others. A couple years ago I joined the Sierra Club. That was a gift a long time coming that lives up to a commitment I made twenty years ago…to care about my impact on the Earth and leave it better off for future generations. Last year I gave myself a month off between an old job and the new one. 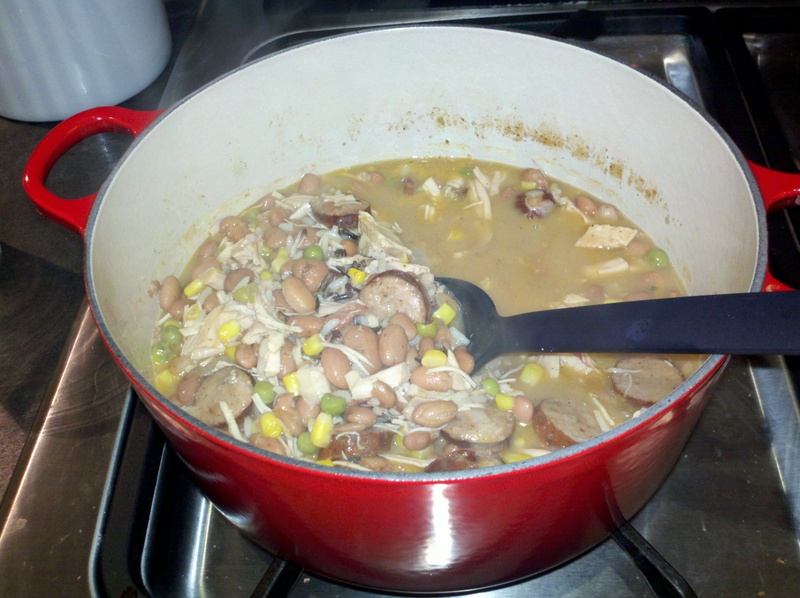 Not sure if my wife appreciated that one–both of us being home at the time, but I like to think she did. 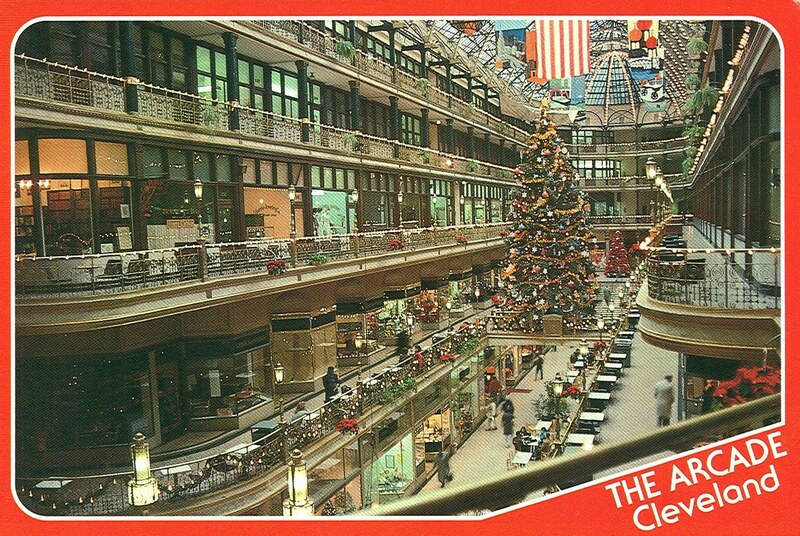 When I was a kid growing up in Cleveland, my parents used to take my brothers and sisters and I to the Cleveland Arcade every Christmas. 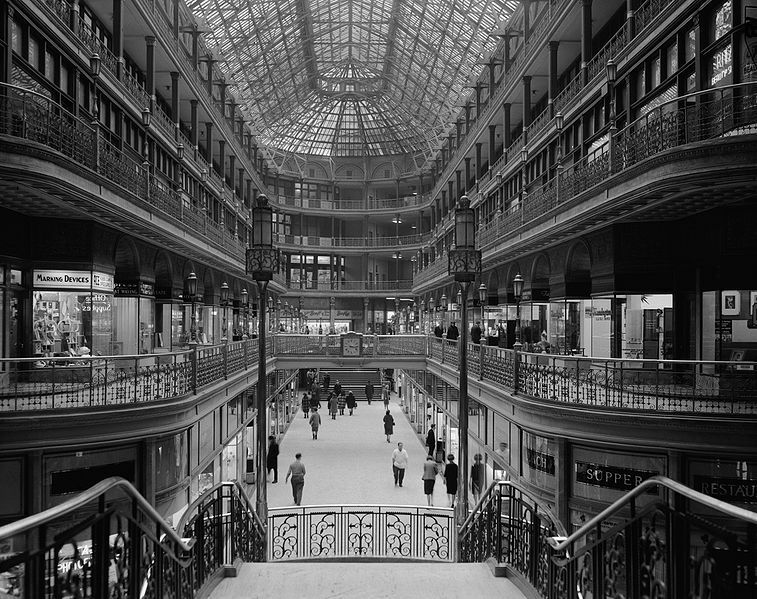 A magnificent arcade of glass, steel and bronze (one of three great arcades on Euclid Avenue), we shopped at the toystore where ceremoniously, I would pick out my own tin soldiers each year. I know, I know you could have Transformer or G.I. Joe action figure…but there amid the glow of christmas lights reflecting off the bronze banisers, amidst the smell of fresh popped popcorn and roasted nuts, I wanted to buy my own sharpshooter or mounted knight. 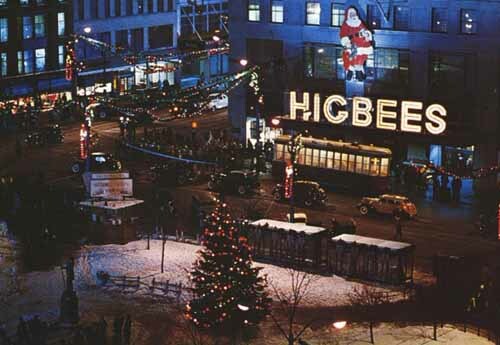 Cleveland knew how to hold onto its Christmas spirit during the “rust-belt” years better than anyone else. That’s why they could film A Christmas Story there in the mid-80s without a bit of prop or scenery. The Higbee’s that Ralph visits to sit on Santa’s lap? It was exactly the same thirty years ago, even though the film was supposed to be set in the 50s. Sadly, the old Higbee’s is to become a casino soon I hear. Ok, enough waxing poetic, this year’s gift to myself was strictly fun and it definitely promises to provide dividends to my friends if they’re willing to wait. 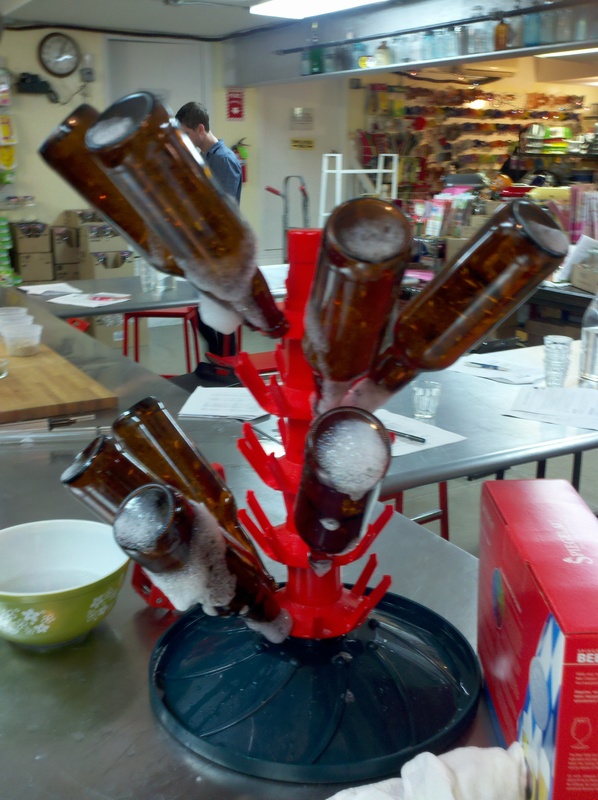 Tonight I took a homebrewing class at The Brooklyn Kitchen. I took home a couple of bottles of the last classes brew, Dirty Water Brown Ale, I think they called it. It needs two more weeks conditioning in the bottle, but I’ll let you know how it turns out. I’m thinking of making a Porter or a Winter Ale for my first attempt at homebrewing this weekend. Brooklyn Kitchen has no shortage of malts and hops which I look forward to sorting through this weekend. I like what Partners & Spade have cooking up this weekend. Apparently pre-wrapped gifts will be available at their space Saturday from 12 – 6pm. Also on tap, goods from a great purveyor (and blogger Matthew Hranek), WM. Brown. Best Made Co. will have something there too. I’ve been dying to try WM. Brown’s charcuterie so I’m definitely stopping in. I wonder if Hranek has given thought to doing some brewing up at WM. Brown? Either way, I’ll be picking up at least one more gift for myself. Big Fracking’ Problem Awaiting New Yorkers? Received an early Christmas gift from the Governor today–a simultaneous veto on the May 5th moratorium on “hydrofracking”, with a new moratorium that pushes it to at least July 1 in a more limited fashion. Hydrofracking or “fracking” is hydraulic fracturing done to stimulate more production from natural gas wells. Fracking injects a cocktail of chemicals deep into the ground in shale deposits, literally fracturing the rock formations, generally below 5,000 feet. Today, Gov. Paterson preserves some upstate jobs, but enables the next governor, Cuomo to do his own due diligence.. I could explain the positive effects of this natural gas drilling “innovation”, but allow me to share a demonstration of one of the side-effects instead. This reminded me of a sad drama that took place in Cleveland more than forty years ago. When I was living in Cleveland, often when we drove past the Cuyahoga river, my father or mother would inevitably tell the story of how the river once caught fire because it was so polluted. Well, I never quite believed them, even though I knew it was truth. Fact is, the river burned not once, but on more than a dozen occasions. The restoration of the Cuyahoga River has been a truly remarkable 40-year effort , but protecting our natural resources, before we have the opportunity to pollute is the best strategy. 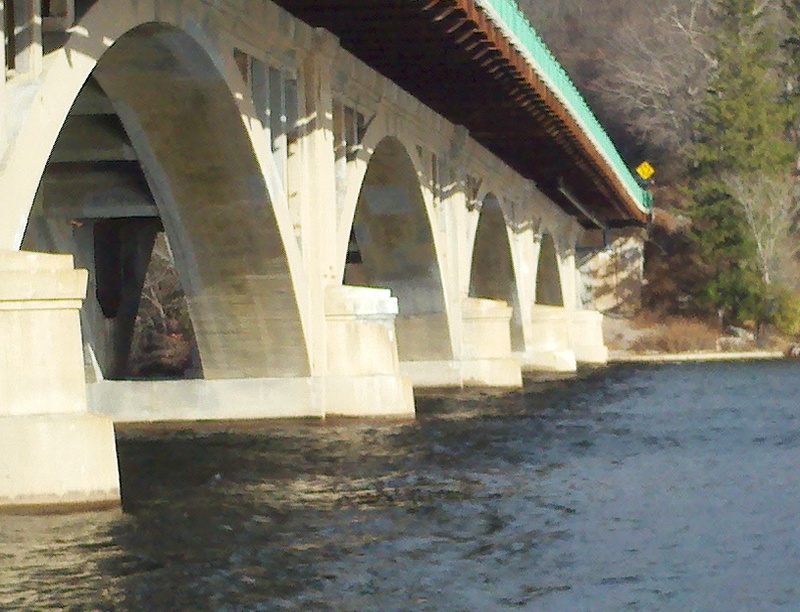 The “burning river” lead to the Clean Water Act and dozens of other policies, including the development of the EPA. During the 80s, my father and I fished Lake Erie but we steered well clear of Cleveland and the river. 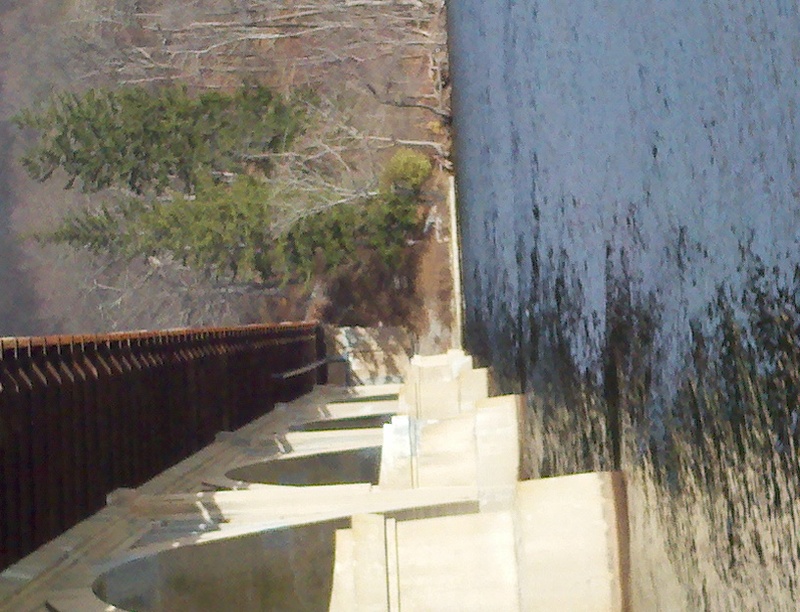 Today, the Cuyahoga has steelhead trout along with smallies and pike, I mean, steelhead? That’s nothing short of a miracle and shows you what can happen when we do right by nature. It does right by us. Back in July, I told my fishing buddies over at Westchester Fishing and encouraged them to spread the word about the intentions of the gas and oil companies trying to hydrofrack the Marcellus Shale deposit which stretches for some 14K miles from New York to West Virginia. Should there be even a small incident, what makes us think we have the technology to protect the entire Catskills watershed AND our NY water supply? 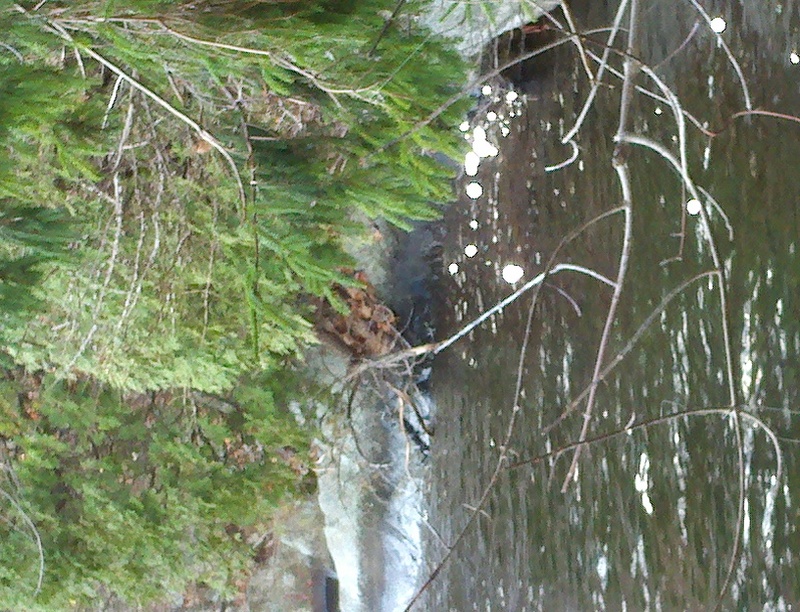 As usual, the oil and gas companies can think of a million ways to get the gas, but have none in mind to clean it up. And if the BP oilspill is any indication of what could happen, we owe it to ourselves, our enviroment, across countless counties and multiple states, to demand more time, diligence, and investigation into the effects of hydrofracking before we drill right below our very feet, possibly endangering the most populous parts of the Eastern Seaboard and its waterways. Hydrofracking of course is just one more technology in a long list that have the potential to go awry. Not only did the Cuyahoga river fire burn in the 60s, the entire town of Centralia, PA was lost to a mine fire. Forty years on, Vice and Palladium captured just how Centralia is doing. *Disclosure* I work for a PR agency, Porter Novelli, who lists American’s Natural Gas Alliance as a client. The contents of this blog DO NOT reflect the views of my employer. I was not asked to write this post on behalf of ANGA or Porter Novelli. I woke up with with flu (day three) and snow flurries and howling wind. The cat, ninja, is somewhere warm. 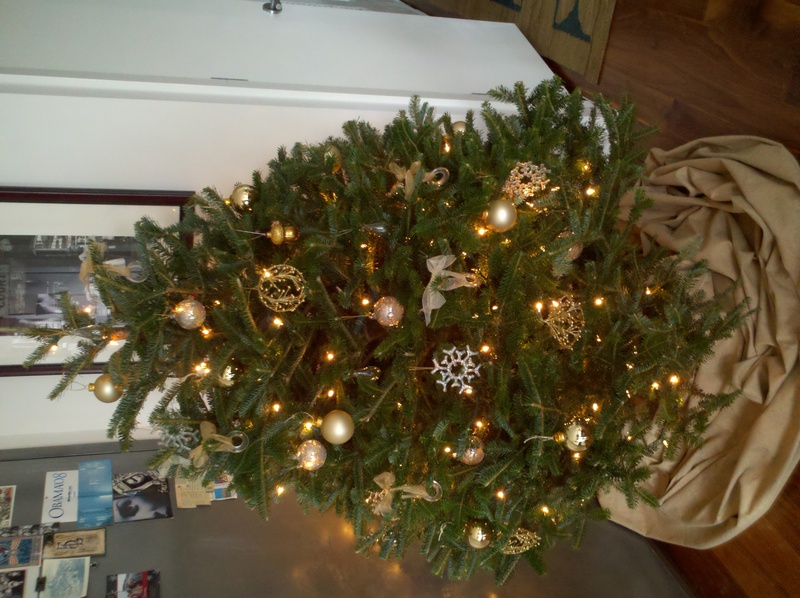 Despite that, it was a busy weekend as we transitioned from fall to winter in my house, and prepared for the holidays. 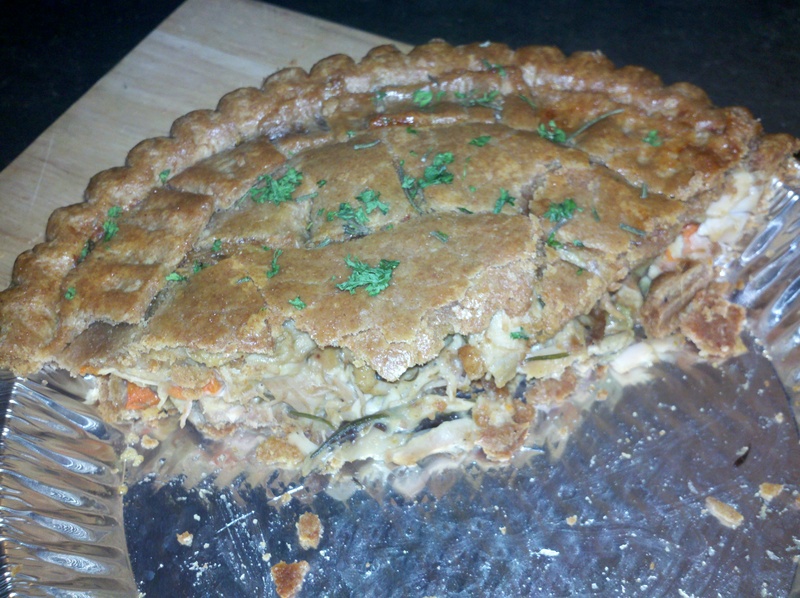 In the last week we polished off the leftover Turkey…. 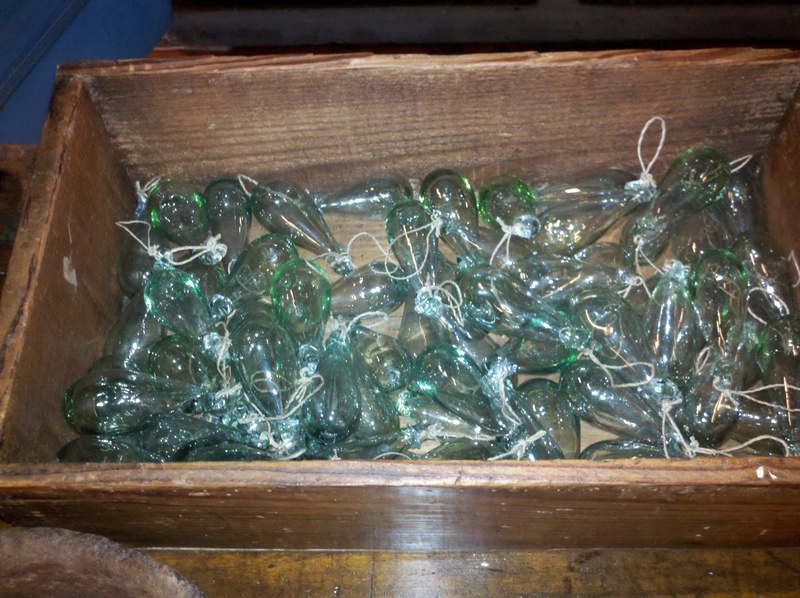 I bought French handblown glass ornaments from Darr’s Williamsburg outpost next to Hollander and Lexer. Darr is one the best curated home goods store I’ve ever been in. Vintage, handmade crafts, items. 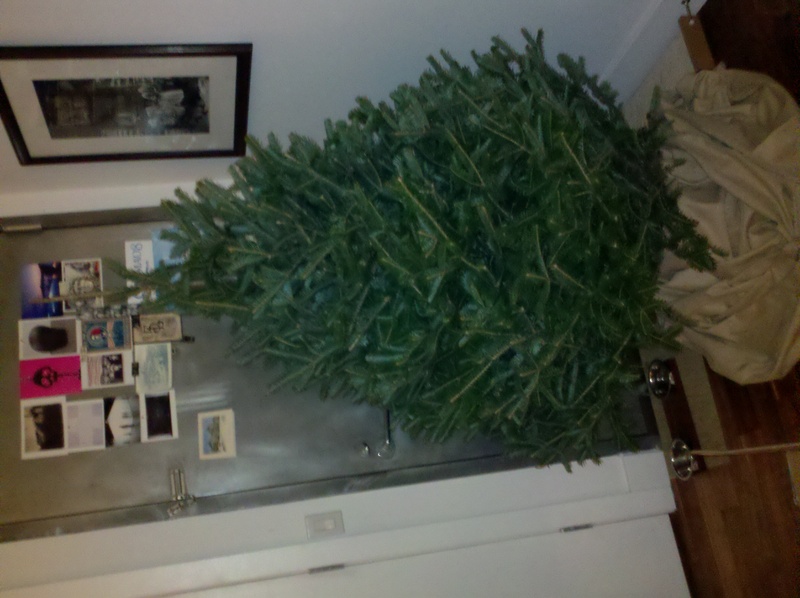 Also hit up LeGrenier but couldn’t find anything for the tree. 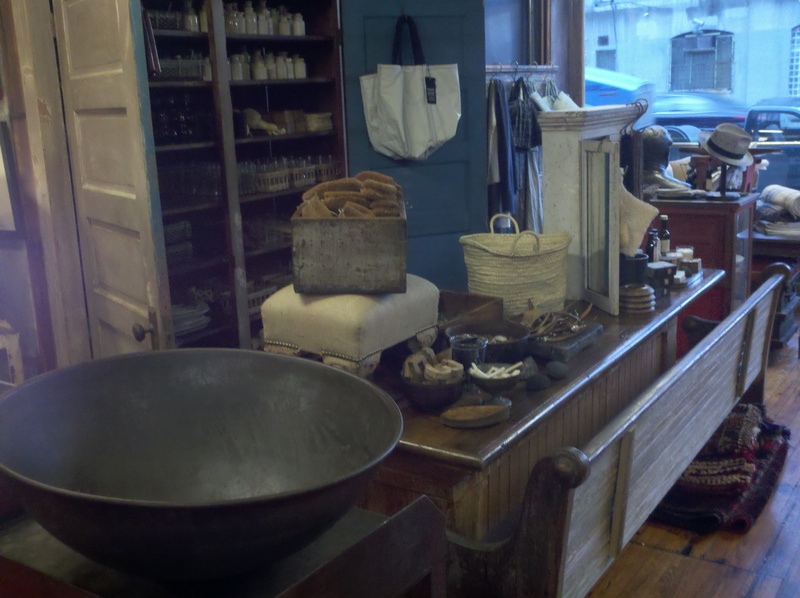 Might hit Brook Farm General Store later…but all are good for Christmas gifts if you’re in the ‘burg and want to shop local. And we hit up Fairway to get food for my annual Festivus Holiday Party. I can’t believe this will be the fifth year. 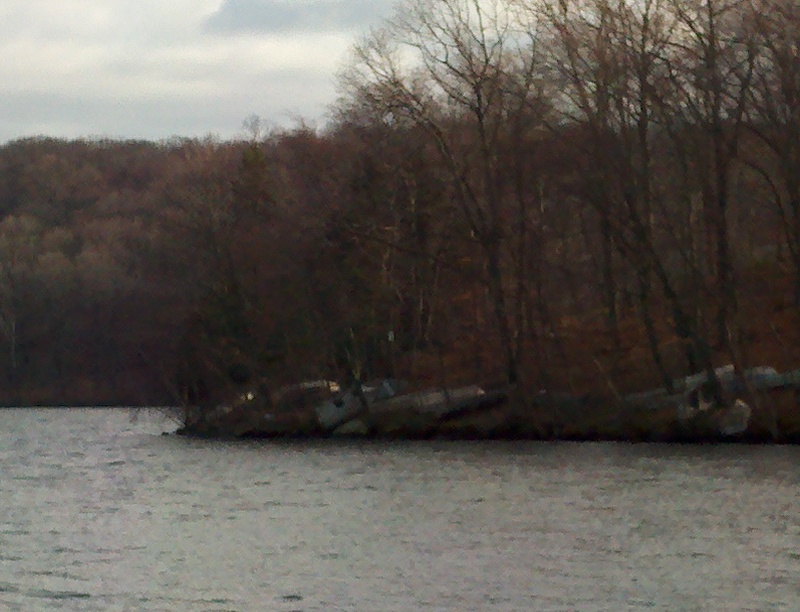 Lastly, went up to Kensico to see if I could snag dinner (Lake Trout) but no luck. The coldfront was biting. 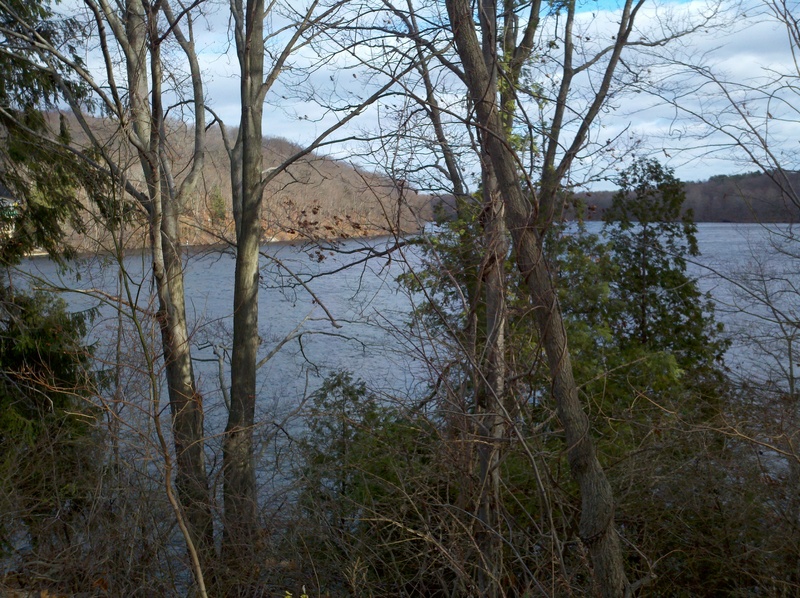 I don’t know what was up with my cellphone’s camera (a 8mb Droid X) but on “landscape” these images came out looking “posterized”. 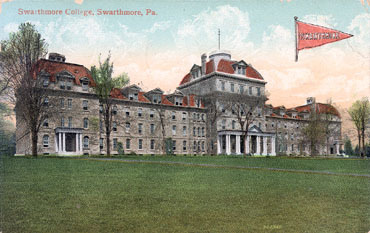 I went to school outside Philadelphia at Swarthmore College (founded in 1864 by Quakers and one of the first co-educational colleges). One never leaves Swarthmore, because wherever you are in the world, you’ll bump into a “Swattie”. 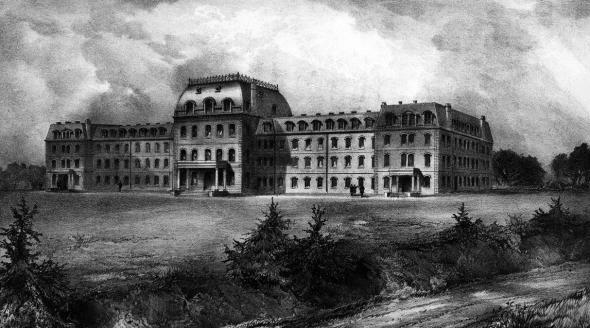 Its a small liberal arts college–one of the best–and its alumni range wide and far, typically go on do civic-minded things. I was invited back to lecture on mass media and politics, and to share my thoughts on what it takes to be leader. I told the students that a) I was too young to lecture them and b) leadership is determined by your choices, c) your choices should be guided by our own moral compass. 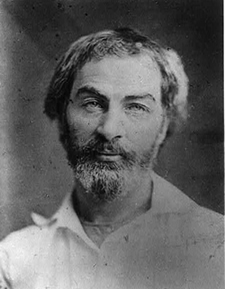 My moral compass has swung wildly sometimes, like all men learning to be adults. I still make mistakes, but I’ve become grounded lately, as I begin to realize what it means to live for others. Leadership, is making choices that serve others first. 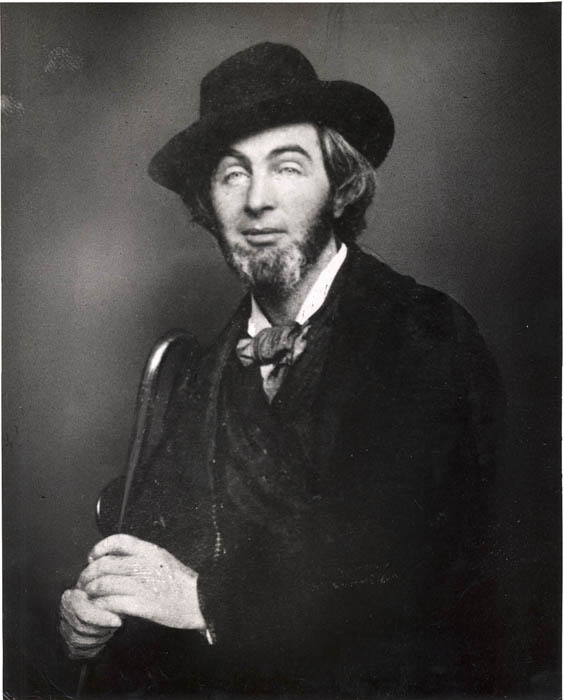 The best moment of the lecture came when I informed the students that the Smithsonian has decided to archive every single tweet every made for all time…and to be careful what they post online. You should have seen their eyes as it dawned on them, that perhaps they had made some poor choices at one point. I assured them that digital media never really dies, but that they could make better choices now that they were informed, that their responsibility (born from the privilege of an education) was to make choices based on their moral compass going forward. While on campus I stopped in at alumni relations and viewed some of the artifacts of a bygone era. 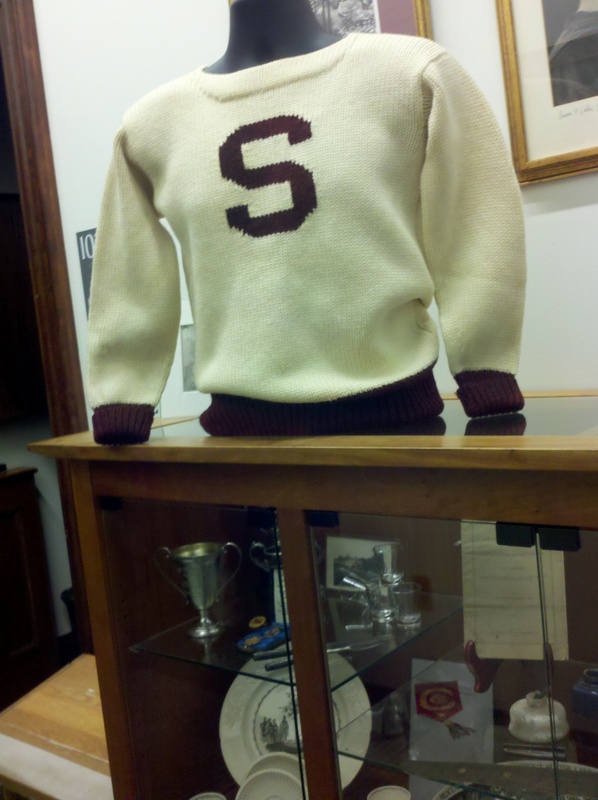 This “S” letter sweater stood out. 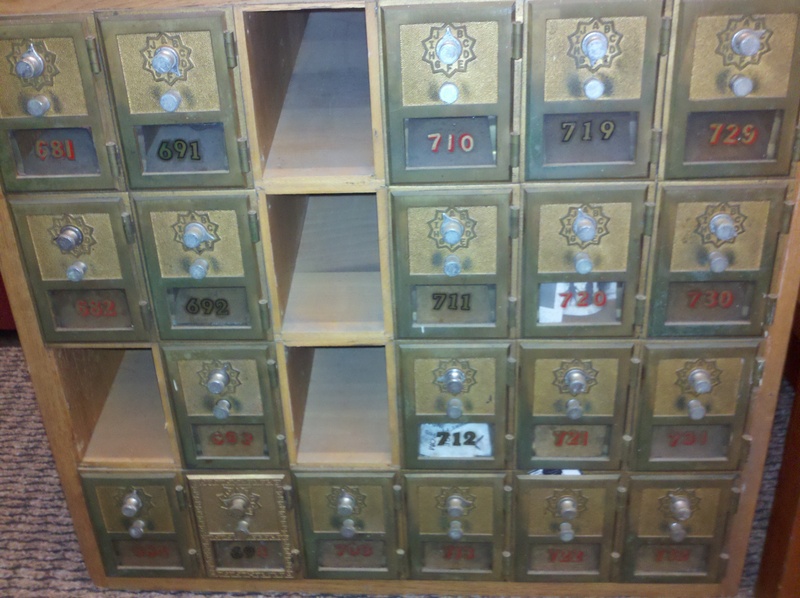 These were the old mailboxes in Parrish Hall. Many a student (and me) had nightmares about these stacks and stacks of mailboxes–terrifying dreams of needing to get something out and being locked out. While in Philadelphia, I stopped by Art in the Age of Mechanical Production. I had heard they were making their own hooch, so hit their Old City store just before closing. While they couldn’t sell me their Root and Snap liquors (both organic), I had a little tasting. 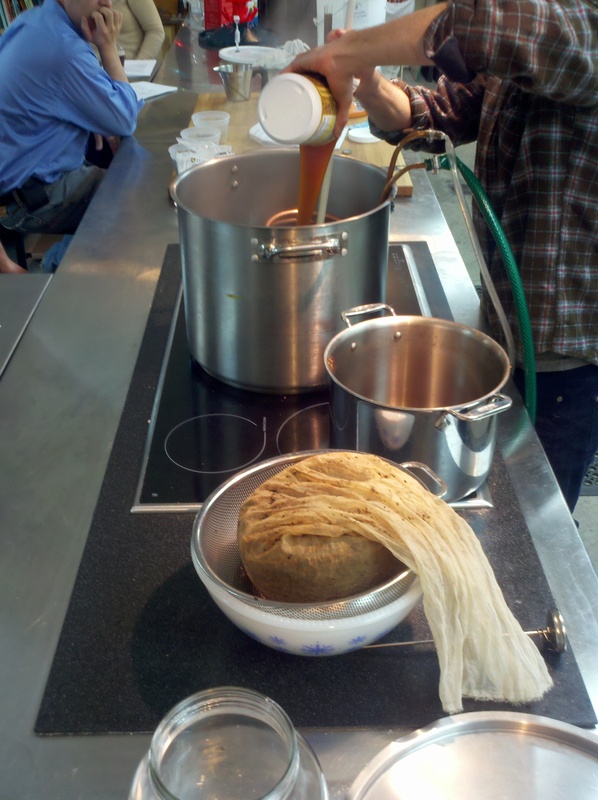 Root is an antique spirit, made from birch bark, wintergreen and other wild roots and herbs in the 1700s. 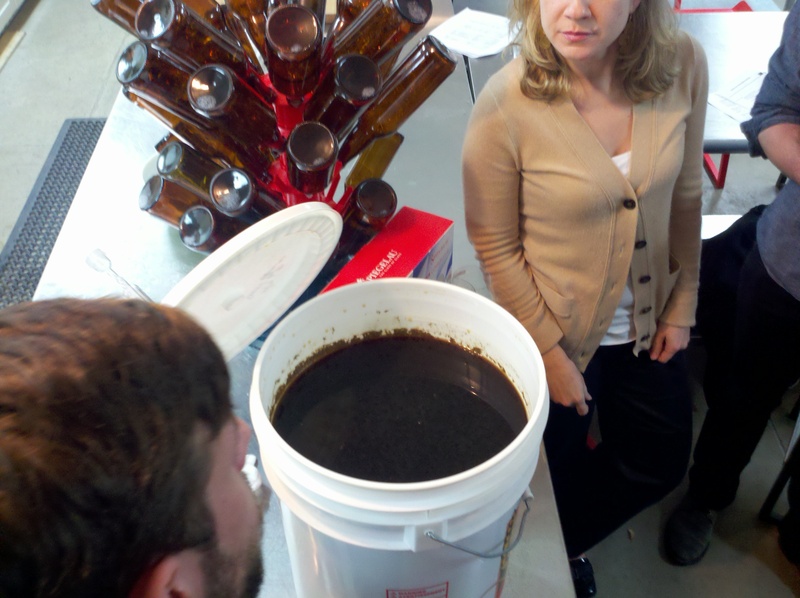 It became the basis of “root beer,” but started out as “root tea”, a spirit. 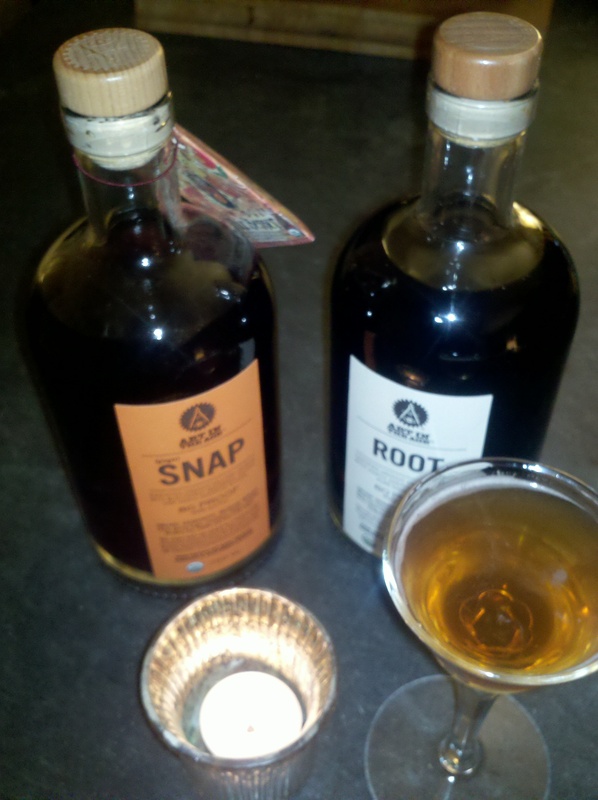 “Snap” is brilliant too–tastes exactly like an original gingersnap cookie, made from blackstrap molasses and ginger. “Lebkuchen”, the original Pennsylvania Dutch cookie is one of my favorite treats so you can bet is going to be in a cocktail at my holiday party next weekend. As soon as I got home, I had to whip up a cocktail. I went simple…1 1/2 ounces Snap, 1 1/2 ounces Hudson Manhattan Rye Whisky, ice, shaken and served straight-up. I call it the Hudson Valley Cold Snap. I also picked up a dope Gitman Bros. flannel. It was heartening to come across Art in the Age, and to see that nearby Sugarcube had survived the recession. I used to live right there on 3rd street across from these shops in a loft. Hoagies, Yuengling beer, Yards beer, the Northern Liberties, La Colombe coffeehouse, Reading Terminal Market, Rittenhouse Square, the Devil’s Pocket, the Roots, Ortlieb’s Jazz House, the Italian Market, Haverford girls, the Mainline. Good times. 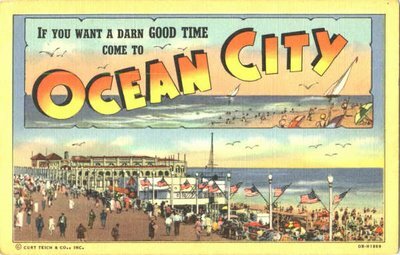 I’m looking forward to going back.